Reduce joint pain from Arthritis and Fibromyalgia. This Art That I Practice and Teach Is Not for the Defeating of My Enemies But For the Healing of the Nation. Yi Chin Ching "Muscle Tendon Changing"
: This set of exercises focuses on the development of strength of the tendons and connective tissues. 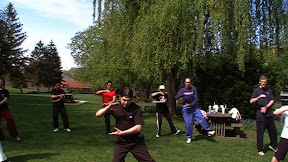 In Internal Martial Arts it is extremely important to condition the tendons and other connective tissues of the body, as much of the power in an internal punch is not generated from the arm itself but from whole body mechanics. The tendons become the weak point in the body chain since muscles receive more blood flow and recover and develop faster than connective tissue. Read more about Yi Chin Ching "Muscle Tendon Changing"
Local Instructor Makes a Case for Traditional Chinese Healing Martial Art. Tai Chi Chuan, a traditional Chinese Internal martial art has become very popular and highly recommended by medical organizations as a low impact exercise for seniors, but one local instructor taking the case that everyone regardless of age can benefit from Tai Chi Chuan training. We have Offered Yoga and Tai Chi in Philipsburg since the late 90's. Our Classes have been held at Highmark Helath Place, the Moshannon Valley YMCA, and Kneading Body Spa. TaiChiTeacher.ORG Ongoing Programs are Currently Offered from Two Schools.